A simple accessory as a cabinet in the bathroom can say a lot about its owner. At Space Age Closets, we don’t just design custom bathroom cabinets according to the space you have. We create designs that match your personality. If you need a minimalistic look, we can design cabinets off the floor to give the impression of space in the bathroom. Place a tabletop bowl for a sink with lots of space for pretty crystals and perhaps, a touch of green reflected in a mirror and you have an elegant corner in the bathroom. Looking for lots of storage space? 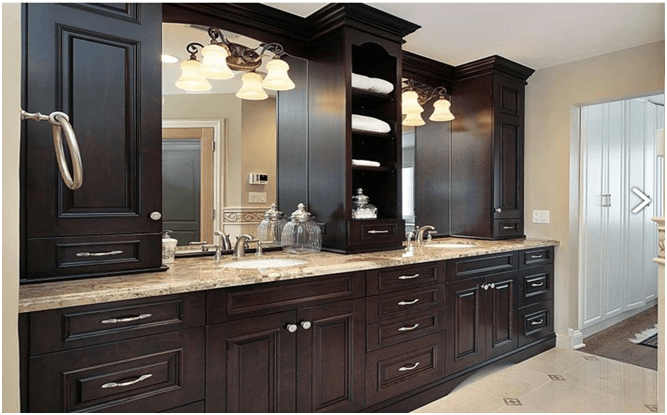 We’ll design the perfect custom bathroom cabinet that can carry all the linens, towels, and washcloths you need. We can also design a small hideaway step stool with drawers to put away your makeup, skincare and hair care products and lots more. Would you like to add a section for medicines? We’ll make sure you have one that is free of moisture. Should you talk to our designers at Space Age Closets, you’ll be surprised at how versatile bathroom cabinets can be. Are you looking for a custom bathroom cabinet for a teenager’s bathroom? We’ll design one that comes with an iPod docking station? Would you like a stylish vanity for your own bathroom? We’ll make sure you have one with adequate lighting and large mirrors for wearing makeup with precision. And, they’re great for shaving too. We’ll also make sure you have the drawers needed to store your curling irons, hair dryers, and any other gadgets you have. For bathrooms that are compact, we have the tower bathroom cabinets that allow you to stock all the supplies in the many shelves and drawers. Here’s another trick. We’ll place the mirror on a slim wall-mounted cabinet so you have extra space behind the mirror for an array of bottles and accessories. Yet another space-saving strategy is to place rods and so you can hang up hand towels instead of having a basket on the countertop. Trust in Space Age Closets for an exciting range of bathroom cabinets that suit every taste and preference.